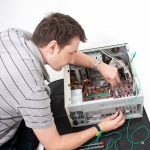 Not every repair requires a trip to the store to solve the issue. 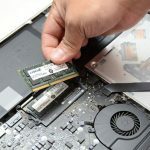 If your laptop has a cracked or malfunctioning screen, you may be able to fix it yourself! Follow this step-by-step guide for a Dell laptop screen repair that you can do yourself. Disconnect your laptop from any charging cables, power it off, and remove the battery. Using a small plastic spatula or guitar pick, begin to separate the surrounding plastic cover from the screen. Once the cover is fully separated, remove it and set it aside. Using the appropriate screwdriver, remove the 6 screws from the exposed display. Typically, there are 2 screws at the top and 4 at the bottom of the display. As you begin to pull the display away from the remaining frame, take note of the webcam cable. Disconnect the webcam cable to pull the display further away from the frame. After removing all screws and the webcam cable, lay the screen flat down on the keyboard. Disconnect the remaining video cable by carefully peeling away the tape holding it to the laptop. After completely disconnecting both the webcam and video cables, your screen should be free. Remove the broken screen and locate your replacement screen. Follow these steps in reverse to install the new screen. If you would like further assistance, contact your local Computer Troubleshooters technicians. We would be more than happy to handle your Dell laptop screen repair! Find a CT location here and rest assured knowing your laptop is in good hands.